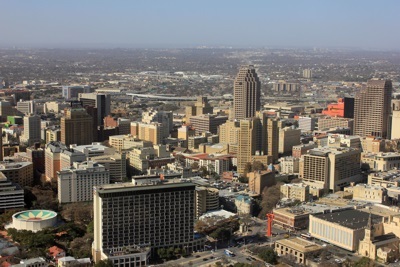 San Antonio is the second most populous city in Texas and the seventh most populous city in the United States over all. As of 2006, the city had an estimated population of 1,296,682, and the San Antonio metropolitan area had an estimated population of 1,942,217. San Antonio's economy is principally based on healthcare, defense, financial services, and tourism. Just to the Northwest of the city center is the South Texas Medical Center, which is a conglomeration of hospitals, clinics, educational and research establishments, and which in total employs over 27,000 people. Meanwhile The defense industry in San Antonio employs over 89,000 people, and additionally there is a large military presence in the area, including the bases at Brooks City-Base, Fort Sam Houston, Lackland Air Force Base and Randolph Air Force Base, all within the city, and Camp Bullis and Camp Stanley just outside the city. San Antonio is a popular tourist destination, visited by more than 20 million tourists each year. Attractions in San Antonio include the SeaWorld San Antonio and the Six Flags Fiesta Texas theme parks. Also popular is the River Walk (also known as "Paeo del Rio"), which is a network of walkways in the downtown area around the San Antonio River, and contains many shops, restaurants and bars. Finally, any description of tourism in San Antonio, can not go without mentioning the San Antonio de Valero Mission, which is popularly simply known as "The Alamo". Today a museum, the Alamo is a former mission and fortress which was the sight of several battles, including most famously the 1836 Battle of the Alamo, one of the key battles fought between the Republic of Texas and Mexico during the Texas Revolution. DK Eyewitness Travel Guide: Top 10 San Antonio and Austin will lead you to some of the best attractions in Texas: Explore the Alamo, stroll the River Walk, and shop the Historic Market Square. The guide is divided by area with restaurant reviews for each, as well as recommendations for hotels, bars and places to shop. This fully updated, pocket-sized guidebook is packed with must-see galleries and museums, the liveliest bars, clubs, and live music venues, the most fun places for kids, best hotels on every budget, and much more. There are dozens of Top 10 lists covering the Top 10 restaurants, Top 10 liveliest bars and clubs, the Top 10 places to stay — and even a Top 10 list of things to avoid! DK Eyewitness Travel Guide: Top 10 San Antonio and Austin contains a pull-out map and guide that includes fold-out maps, useful phone numbers, and 60 great ideas on how to spend a day in San Antonio and in Austin. Embrace your inner cowboy and discover the heart of the Lone Star State with Moon Austin, San Antonio & the Hill Country. With Moon Austin, San Antonio & the Hill Country's practical tips, myriad activities, and local insight on the best things to do and see, you can plan your trip your way. Our author, a longtime resident of Texas, hits all the highlights, from the Alamo to Lake Travis. He's checked out all the city's best hotels and restaurants in person, and offers authoritative, candid reviews that will help you find the choices that suit your tastes and budget. You'll also get up-to-the-minute coverage of shopping and nightlife; detailed walking tours; accurate neighborhood maps; advice on planning a successful family vacation; and the inside scoop on Austin's music scene and San Antonio's rich history. This edition features expanded side trip coverage of the beautiful Texas hill country--your guide to the best hikes and the best barbeque.